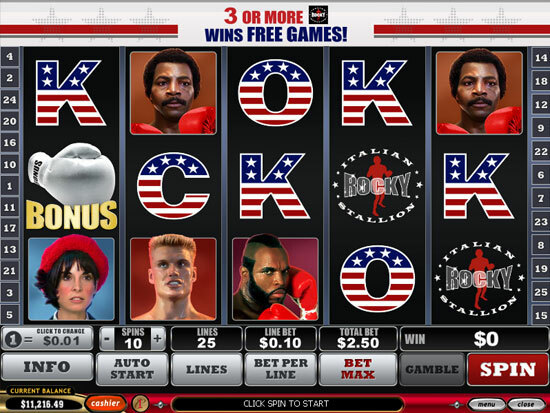 Rocky, the 5-reels 25-payline video slot is perhaps Playtech's most spectacular new game with a live footage from the film Rocky with superb graphics, an exciting bonus game and several other cool features. For example, if any of the film characters are involved in a winning combination, you will see a tiny part from the real film. When the White Glove appears on reel#1 and the Red Glove appears on reel#5 simultaneously, an animation is played before the Knockout Bonus is triggered. A screen appears with the figures of Apollo, Ivan and Clubber. Next you choose one of them as your opponent in the coming Boxing Match. Don't worry, you will not fight, Rocky will do it for you. The fight can go up to 10 rounds. Each round Rocky wins, you are awarded 3 times your total bet. All matches end with a knockout in favour of Rocky. If he finishes his job earlier than in the 10th round, all the remaining rounds are considered to be won by Rocky. If 3, 4 or 5 Rocky Scatter symbols appear anywhere, 15, 20 or 25 Free Games are awarded. All wins during the free games are doubled.